This evening I was playing around with my macro filters, trying to get some decent shots to submit to the photography group that I just joined (more about that in a moment). I set up my lightbox with my poor excuse for lighting and props, mounted the camera on the tripod and spent about an hour getting totally frustrated. Macro photography is totally different from what I normally shoot. Trying to manage the depth of field, adjusting the aperture and trying to balance DOF to shutter speed, was driving me nuts. The plane of focus was so small! Finally I just grabbed the camera and started wandering around the house looking for things to shoot hand-held. I even resorted to using the pop-up flash. Photo taken with a Nikon D700, 50mm lens with 10X macro filter, processed in Paintshop Photo Pro X3. Yeah, I know it’s a little (ok, a lot) blown out on the bottom right, but I still like the way the flash stopped the water droplets right on the tip of Macho’s tongue. It made me laugh, and sometimes that’s a good thing! Now, back to the photography group. I attended my first meetup last night of the AZPhotographersGroup. The meeting was an open forum where you could ask any question you wanted about photography. I learned so much just from the discussions around each of the questions. Then Nick, the organizer of the group, presented some tips on how to photograph people, which is what I’m starting to concentrate on now, and once again I picked up some great information. The people were all friendly and willing to share information with newbies such as myself. The group is very active, with several organized events and photowalks each month. They also do monthly photo challenges where they present a theme and members submit photos relative to that theme. This month, it’s macro photography…which explains why I was playing with the 10x filter this evening. If you’re in the Phoenix/Tempe area, I recommend that you check them out. I’ve already signed up for a workshop next month on how to use an off-camera flash. Now all I have to do is get my hands on a flash unit before then! If you like my work, please subscribe to this blog and feel free to offer comments. You can also find me on Facebook at ZannWalker Photography. This entry was posted in Equipment, Information, Learning, Shooting and tagged 10X, 50mm, Arizona, AZ, AZPhotographersGroup, camera, cat, D700, depth of field, flash, macro, Meetup, Nikon, Paint Shop Pro, photography, tripod. Bookmark the permalink. WOW!!! I love this photograph! 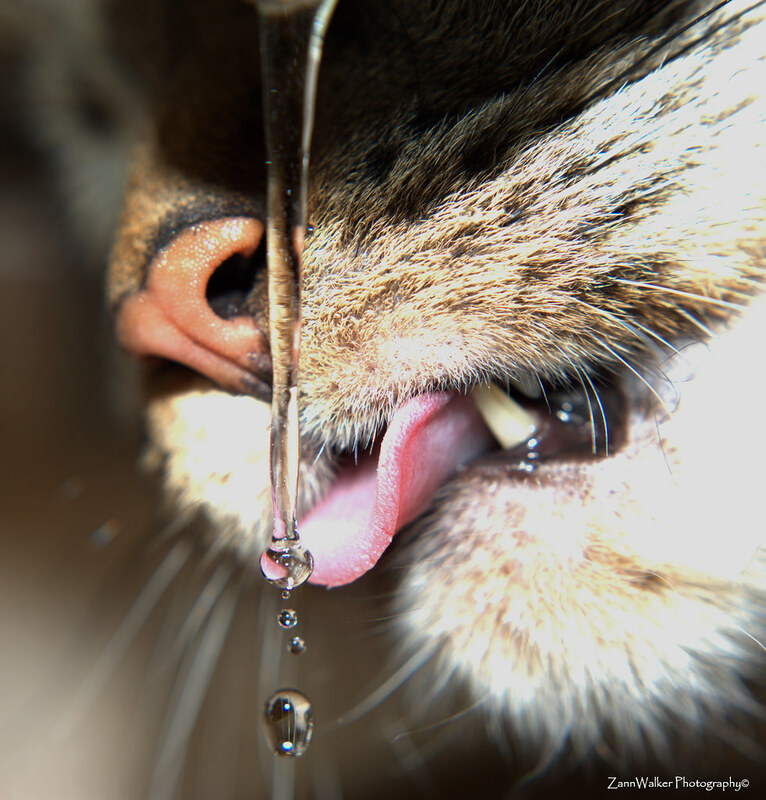 The water droplets, the texture on the cat’s tounge, the moisture on his nose. AMAZING!!! this is very cool, suzanne……i love the water droplets ! What a cool picture, with the sharp details. Well done! !